All collectors, irrespective of whether they’re philatelists, sigillographers or numismatists, require certain accessories to store or display their collections. While investing in bullion is not the same as numismatics, investors who have purchased gold coins require protection for their assets. A range of accessories are available to store your gold coins safely, as well as ensure that the coins do not get damaged in any way, thereby reducing their value. Physicalgold.com understands the requirements of gold and silver coin investors and have a range of useful and stylish accessories that you can choose from. coins safely away from dirt, dust, scratches or any other kind of damage. Our coin capsules are chemically neutral. 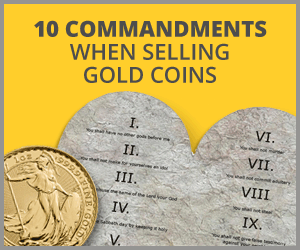 This means that there can be no adverse reaction that’s likely to tarnish or discolour your precious metal coins. The coin capsules are manufactured to the exact sizes of the popular coins. Coin capsules designed to fit the full and half gold sovereigns are available from our online store. The gold full Britannia is another popular coin and an acrylic capsule for storage is also available to buy. Storing your gold at home can always be a risky business. Homes usually do not have the failsafe security devices that can be found in a bank or a secure storage vault facility. Your home is always vulnerable to a break-in by burglars. In the event of such a calamity, your precious metals are always at risk. In order to safely conceal them in your own home, it’s important to invest in innovative storage solutions for your home that can store your precious metals safely away from being discovered by criminals. An excellent solution is the secret stash wall clock. It looks just like an ordinary wall clock but opens up and has a storage compartment inside to store your gold coins, bars and jewellery. So discrete, it looks like part of the wall! Yet another innovative hidden storage solution is the wall socket hidden storage. It looks exactly like a standard UK electrical plug socket on the wall but opens up to reveal a deep cavity in which your bullion can be safely hidden away. These practical, yet clever storage accessories are unique and great as they conceal your precious metals right under the very nose of the burglars. So, while they’re searching drawers, cupboards, walls and floorboards, they don’t realise that your valuables are in a very visible place. Lastly, there’s the lockable cash box, which is a great storage solution, although it isn’t a concealed one. Once you’ve put your precious metals in the box, you have to find a safe place to hide it. At Physicalgold.com, we have quality presentation cases that comes along with acrylic coin capsules. The cases are primarily for storing full or half gold sovereigns and can accommodate 10 coins in each case. Our team consists of coin experts who can advise you on the best way to store your coins so that it stays in mint condition for years to come. Please call us on 020 7060 9992 or get in touch online to speak with a member of our team. This entry was posted in Blog and tagged coin accessories. How Does the EU General Data Protection Regulation (GDPR) Impact Gold and Silver Trading?